Saturday, June 17, 2017 – 10:00 – 11:00 am: Pavestone Walkway: Laying the base, arranging paving stones. Sunday, June 25, 2017 – 1:00 – 2:00 pm: Build a Wood Fence: Install Fence posts, rails and boards. Saturday, July 15, 2017 – 10:00 – 11:00 am: Maintain A Deck: Stripping, cleaning and staining. Wednesday, July 19, 2017 – 7:00 – 8:00 pm: Tile Floors and Walls: Select, lay cut and grout tile. Saturday, August 05, 2017 – 10:00 – 11:00 am: Build a Deck: Learn how to plan and install a deck. Wednesday, June 21, 2017 – 7:00 – 8:00 pm: Painting Your Home’s Exterior: Prep and paint or stain. Saturday, June 24, 2017 – 10:00 am – 12:00 pm: Build a Tool Box – Canada Day. Join our hands-on workshop and you and your child can build a tool box. Saturday, July 08, 2017 – 10:00 am – 12:00 pm: Build A Bug House. Join our hands-on workshop and you and your child can build a bug house. To book your slot at a workshop, contact your local Home Depot location. 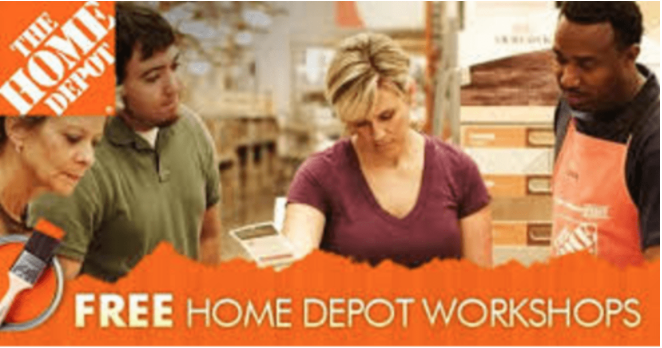 Click here to get all Home Depot Canada online offers.